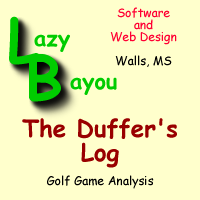 The Duffer's Log 4.0 provides golfers a means to maintain an accurate history of their golf game. Numerous reports and datasheets can be used to analyze your game and determine the areas where you should concentrate more or less effort in practice. The Duffer's Log provides golfers a means to maintain an accurate history of their golf game including stats like those used on the professional tours. Numerous reports and datasheets can be used to analyze your game and determine the areas where you should concentrate more or less effort in practice. You can print blank score sheets for all the courses you play and maintain a game history with stroke averages, putting averages, long drives, gross and net scores, percent greens hit and fairways hit along with many other stats for all the games you and your playing partners play. The score sheets provide spaces for entering the data needed to produce the statistics. A built-in course editor makes it easy for you to add, edit and delete courses along with their par and comments, saving you time by allowing you to later select a course from a drop-down list without you having to fill in all the course information. The Duffer's Log allows unlimited golfers, games and courses allowing you to maintain your golfing history for yrars to come. A complete, easy to use, package for golfers who want to maintain an easily accessible record of their games and scoring history. The Duffer's Log allows unlimited golfers, games and courses allowing you to maintain your golfing history for yrars to come. Numerous reports and datasheets can be used to analyze your game and determine the areas where you should concentrate more or less effort in practice. You can print blank score sheets for all the courses you play and maintain a game history with stroke averages, putting averages, long drives, gross and net scores, percent greens hit and fairways hit along with many other stats for all the games you and your playing partners play. A complete, easy to use, package for golfers who want to maintain an easily accessible record of their games and scoring history. The score sheets provide spaces for entering the data needed to produce the statistics. A built-in course editor makes it easy for you to add, edit and delete courses along with their par and comments, saving you time by allowing you to later select a course from a drop-down list without you having to fill in all the course information. The Duffer's Log 4.0 provides golfers a means to maintain an accurate history of their golf game including stats like those used on the professional tours. Numerous reports and datasheets can be used to analyze your game and determine the areas where you should concentrate more or less effort in practice.